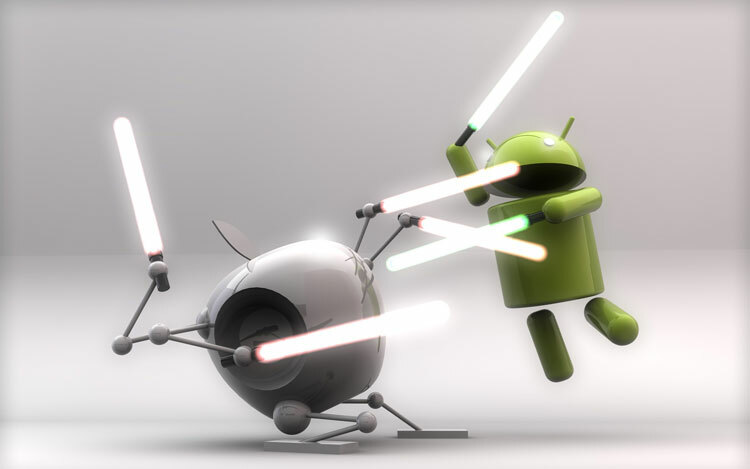 Android conquers marketshare, Apple conquers profits: Who’s winning? 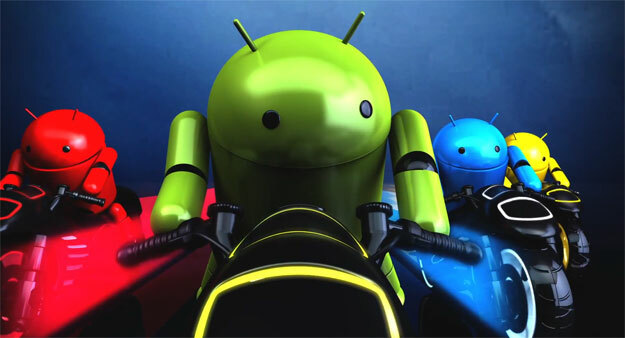 A new report from market research firm Gartner has phones running Google’s Android operating system accounting for 52.5 percent of the worldwide smartphone market in the third quarter of 2011, giving it more than three times the share of its nearest global competitor Symbian, with a 16.9 percent share. 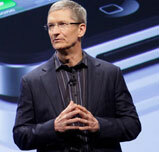 (Apple’s iOS managed a third-place finish for the quarter, with a 15 percent share.) Overall, Gartner found that nearly 60.6 million Android phones were sold to customers during the quarter, compared to about 17.3 million iPhones. With figures like that, it’s easy to jump to a conclusion that Android is winning the smartphone wars: after all, when a product’s share or sales tips over 50 percent, it’s generally viewed as a market-dominating force. And there’s no question that Android is seeing considerable success, particularly entering into the end-of-year holiday season with a plethora of new tablet devices (like the Kindle Fire and Barnes & Noble Nook Tablet) and Android 4.0 Ice Cream Sandwich heading at consumers. But as Charlie Sheen can attest, there’s more than one definition of “winning.” A report distributed to clients this weekend by Oppenheimer shows another interesting story: it finds that, among Android handset makers, only HTC and Samsung seem to be making any money. What’s more, Apple appears to have captured roughly two thirds of the operating profit in the entire smartphone business — a margin Oppenheimer believes will increase a bit in 2012. What matters more: market share or actually making money? It’s easy to see Android’s recent dominance of smartphone sales as a huge advantage for the platform. After all, more people buying Android devices translates to more sales for device makers, more contract and pre-paid subscribers for mobile operators, and a growing market for app and service developers making software for Android. This is how ecosystems are made: Build a platform, stimulate customer interest, provide third-party opportunities, then reap the benefits of growth while continuing to innovate the platform. Despite the lingering cloud of patent litigation and encumbrance from the likes of Oracle, Microsoft, and (indirectly) Apple, Android has effectively executed in this idea. Even though Android got off to a rather fitful start (especially compared to the already-mature iPhone), Android has rapidly evolved its technology and interface to the point where it frequently rivals Apple, and in some cases exceeds Cupertino’s efforts. The diversity of the Android hardware world does make for an uneven experience — some devices perform well, while others are sluggish or eat batteries — but for many consumers that diversity of devices is precisely the appeal of Android. Mobile users who want a smartphone with a QWERTY keypad for messaging or a 4-inch or larger screen simply have nothing to buy in the one-size-fits-all iOS world. Android has also worked hard to catch up with iOS on the interface and fit-and-finish department — although Android still isn’t as consistent as iOS, in a few instances Android now arguably exceeds Cupertino’s efforts. And it’s not just consumers embracing Android, it’s developers too. The Android Market now sports more than 320,000 apps compared to about 450,000 in the Apple App store. (Although, interestingly, over a third of Android apps have been removed from Android Market since they were published, compared to less than a quarter of apps released for iOS). For iOS and Android, the sheer number of apps available for each platform is ceasing to be an issue: basically, if mobile users want an app, odds are it (or something close) is available for both platforms. Historically, Android’s broad marketshare should translate to long-term success for the platform, giving it a large installed base of customers who, if they like their initial Android devices, are likely to stick with the platform (and their apps) when they move on to their next smartphone. Similarly, they’re more likely to embrace Android on other devices like tablets and (Google hopes) televisions, since they’re already familiar with the operating system and ecosystem. For that installed base, sticking with Android becomes the path of least resistance — similar to how Microsoft Windows has been able to maintain market dominance of desktop operating systems. However, comparing Android’s smartphone market share to iOS is also a bit misleading, since it pits the marketshare of a number of handset makers — Samsung, HTC, Motorola, LG, Acer, Sony-Ericsson (and, heck, even the likes of Dell, ZTE, Huawei, Pantech, Garmin, NEC Casio, and Cherry) against a single company: Apple. Comparing companies directly, Samsung is ahead, but Apple is a close second place. Yet, if Oppenheimer’s figures are accurate, Apple currently accounts for about two thirds of the entire smartphone industry’s operating profit, despite a second-place (and, arguably, dwindling) share of device sales, although the smartphone market will continue to buoy all players as it grows. 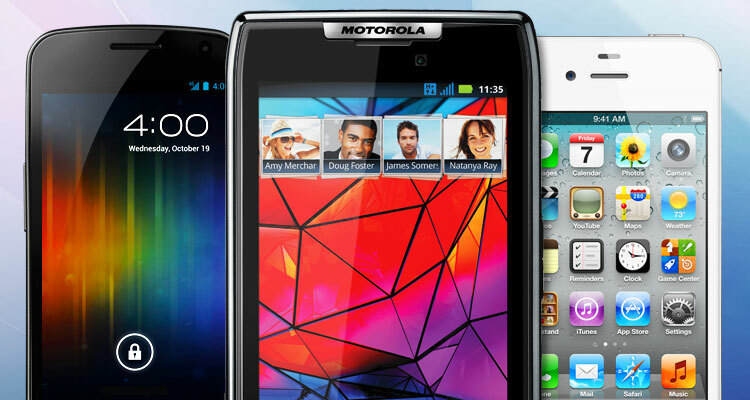 But by 2012, Oppenheimer doesn’t expect Motorola, LG, Sony-Ericsson, or Nokia will be earning any significant profit in the smartphone business, despite having significant revenues. And Samsung’s profit will be roughly one quarter of Apple’s. Regardless of marketshare, it’s very difficult to persuade device makers to support a platform if they can’t reasonably expect to make money by building devices. Even companies that seem positioned to at least do decent business in Android devices are hedging their bets: Both HTC and Samsung are marketing Windows Phone devices, and Samsung hasn’t given up on Bada, which it controls. In other words, despite Android’s current popularity, making Android devices doesn’t seem to be a sure-fire business opportunity. How did Apple capture smartphone profits? In part, Apple’s lead in profit is buoyed by ruthless business decisions with carriers: Apple famously charges carriers substantial fees up front for every iPhone sold. Apple’s original deal with AT&T with the original iPhone had AT&T paying Apple every month for every iPhone on the market. That kind of revenue sharing went away with the iPhone 3G, but the high costs of offering the iPhone continue: U.S. carrier Sprint is reportedly paying Apple $500 for ever iPhone 4S it sells; AT&T and Verizon Wireless aren’t much better off with a reported $400 up-front price, although they pay lower prices for the previous iPhone 4 and (for AT&T) 3GS. 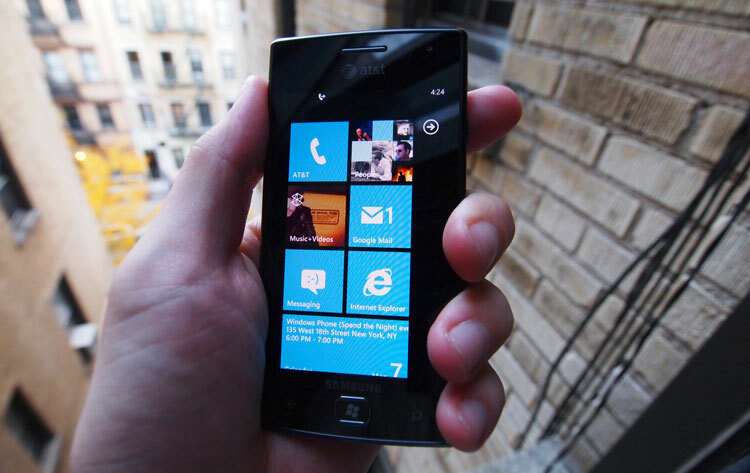 A typical subsidy to a smartphone maker is about $250 per device. It would be safe to assume Apple takes a similarly high-priced stance with international carriers. By that token, Apple’s lead in revenue ought to be about 60 to 100 percent higher than other handset makers on a unit-for-unit basis. And that roughly bears out in Oppenheimer’s figures (although they compare revenue share, rather than raw revenue). 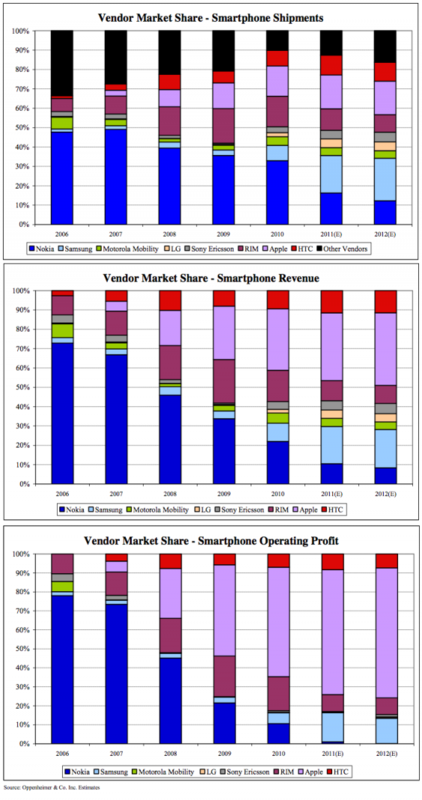 For 2011, Oppenheimer estimates Apple will account for about one third of the smartphone industry’s revenue. Samsung accounts for about 18 percent — a bit over half Apple’s whilst moving more units — and HTC, RIM, and Nokia are expected to manage about 11 percent each. One might think that, with Android gaining so much traction with consumers, Android device makers could extort similar premiums from carriers. That doesn’t seem to be the case. After all, if Samsung decides it wants $500 per device from carriers, those carriers can just turn to HTC or Motorola for a different (and some might argue, better) Android device… then play the makers against each other. In this sense, the diversity of the Android ecosystem actually works against device makers. It does create market forces that ought to help keep prices down for consumers, but which also mean manufacturers are operating on little or no margin. As the sole provider of iOS devices, Apple does not face that pressure. Its profit margins are not being eroded by competitors offering the same platform. By the same token, Apple feels no pressure to lower its prices to consumers — especially since it seems to be able to sell almost everything it makes. Apple further leverages its position by working out beneficial supply chain deals with component suppliers — and this is the area where Apple’s current CEO Tim Cook strong operational skills have paid off for the company. Apple famously uses its deep pockets to lock in suppliers, components, and manufacturing processes. This was perhaps no clearer than when Apple rolled out the iPad and would-be competitors found themselves unable to match Apple’s prices even with slower components and smaller screens. In 2010, Apple reportedly locked HTC out of high-resolution “Retina displays” by essentially acquiring all manufacturing capacity. Similarly, Apple has made massive prepaid deals for flash memory and other supply chain components, and bought out all capacity for particular manufacturing processes: There’s a reason there aren’t many other companies doing unibody aluminum notebooks. Google is essentially giving Android away for free. Although device makers might find themselves encumbered by licensing fees to Microsoft (and, in the future, maybe Oracle and/or Apple), pretty much anyone can grab Android’s source code and have a go. Google’s gamble with Android is that it will provide a compelling experience backed by Google services like Google Search, Gmail, and Google Maps — and those services, in turn, earn revenue for Google through advertising and access to aggregate customer data. You’ll notice who is left out of that equation: device makers. They do not share in revenues Android generates for Google. Instead, device makers have to make their money on the outright sale of Android devices, or by making Android devices that tap into their own revenue-generating ecosystems. That’s where the Kindle Fire comes from. Amazon essentially forked Android, put on a custom interface that buries Android in the background, and plugged the device into Amazon’s substantial content offerings, including video, music, and (of course) books. Although Google will arguably see some revenue from advertising to users brought to Google services by the Kindle Fire, Amazon has cut out things like Google Books and the forthcoming Google Music, along with other services were Google could directly collect money from customers. The same idea underlies Barnes & Noble’s Android-based tablet offerings: Use Android to power the device, but do everything you can to lock it into your own services so you can actually make some money. They’re trying to make their money by locking Google out of Android’s revenue stream. Bottom line: despite Android’s dominance of smartphone sales, it’s a tough time to be an Android smartphone maker. And Apple is just fine with that.